Disney Star & American Idol.... Great Concert Combination!! Hey everyone, Jessica here with exciting Tampa Bay Entertainment news! By now you should all know about the awesome concert this Friday at the St Pete Times Forum ~ That&apos;s right, Demi Lovato, with special guest, David Archuleta will be performing live at 7:00 pm. Because we know you all love these types of Tampa Bay events, we&apos;re giving away four more tickets to the show!! The rules are simple; check back tomorrow morning at 11:00 and try your chance at the next round of ticket giveaways... be one of the first five correct posts to the Visit Tampa Bay fan page on Facebook and you could be the winner of two tickets to this awesome concert. So come on, one of the best summer concerts Tampa has to offer is only a facebook post away! Tweet your friends and ask for their help... at after all *the winner gets two tickets! So be sure to read-up on your Demi Lovato facts now and be ready tomorrow @ 11:00 A.M.
Until then, if you&apos;re not already, be sure to become a fan on Facebook @ www.Facebook.com/VisitTampaBay. 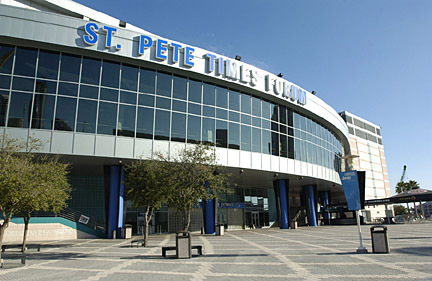 Thanks for participating, and as always check back often for more great things to do in Tampa Bay! !